The first significant English settlement in Maine occurred in 1607 with the establishment of Popham Plantation at the mouth of the Kennebec River. The driving forces behind this venture were John Popham and Sir Ferdinando Gorges, wealthy English businessmen. Severe weather conditions forced the settlers to return to England in 1608, thus allowing Jamestown to stake the claim to being America's first permanent settlement. Relationships with France took a decidedly downward turn when, in 1613, Sir Samuel Argall destroyed a French Jesuit mission on Mount Desert Island. Anglo-French relations would remain tense in the New World for another 150 years. Much of the 17th century in Maine was marked by an ongoing land dispute. Sir Ferdinando Gorges and his heirs based their claim on rights extended to them by the Council for New England, a governmental agency. The competing claim was from resident colonists who wanted to ally themselves with Massachusetts. In 1660, an English board awarded Maine to the Gorges family, but 13 years later they sold their interest to Massachusetts, which continued to control Maine until its statehood in 1820. 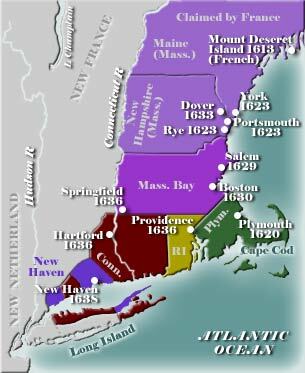 The purchase of Maine by Massachusetts did not truly settle the ownership question, given that the area was also claimed by France. A series of wars, stretching into the middle of the 18th century, pitted the English colonists against French and Indian forces. Much of the warfare comprised raids on white or Native American villages. A high point for Maine residents occurred in 1745 when colonial forces under William Pepperell captured the French fort at Louisbourg in Nova Scotia. The French surrendered their claim to the region in the Treaty of Paris (1763) following the Seven Years' War.